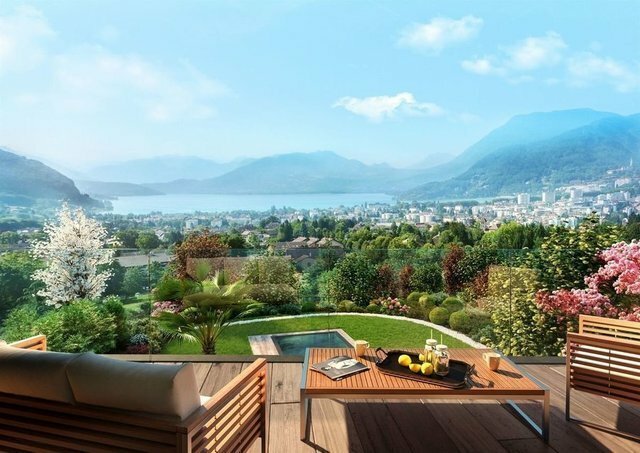 Situated above Annecy-le-Vieux, this luxurious ultra-contemporary villa enjoys a panoramic 180° view over the lake and mountains. Composed of 6 rooms, 4 of which are bedrooms, the main living area has a large surface and overlooks a picturesque exterior. With excellent quality furnishings, the interior can be personally adapted. The project includes 8 top-of-the-range properties of similar size and furnishings. Each villa has a landscaped area, with a swimming pool and a roof garden. Privileged position with no vis à vis. Each Villa has a EuroCave wine cellar, home automation system, as well as double garage with car port. Strong points of this property: - Fabulous view over lake and mountains - Privileged position - Latest generation home automation system - High quality materials - Access to the terrace from all bedrooms - Landscaped garden in harmony with the surroundings - Swimming pool De Meyer Immobilier | Sotheby’s International Realty, your expert in sales and rent of luxury property in Annecy and its surroundings.